I've recently returned to Maryland after 3 weeks in California taking care of some matters, meeting friends and spending some time with my Dad. 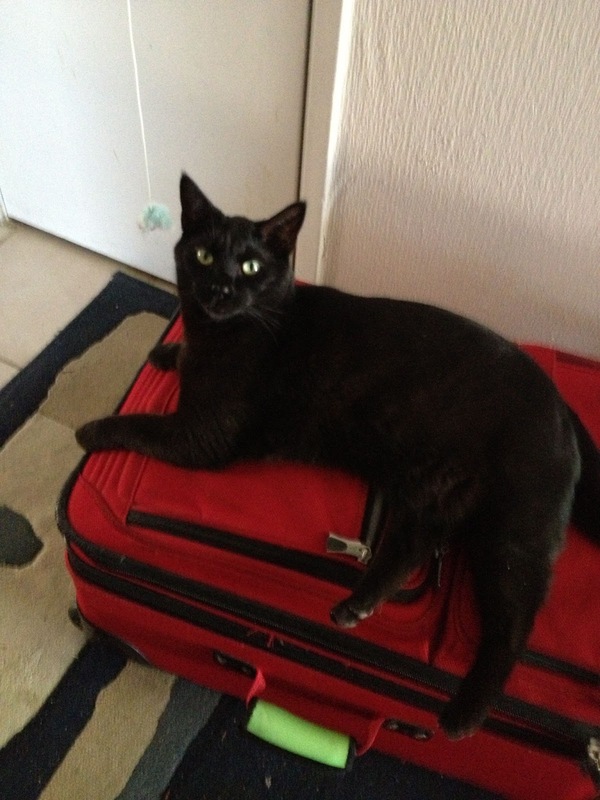 After I packed my bag to come back to Maryland, I caught this picture of Onyx the family cat. He is an absolute sweetheart, even though he can look fierce. He is not happy with me at the moment, he absolutely knows what a suitcase means...no more snacks from the cook in the kitchen! Now that I am back in my favorite crafting room, I am hoping my mojo comes back. I signed up to take Online Card Classes' newest class His and Hers. This is another week-long course. For today's homework I chose to use the same basic sketch, the same sentiment set, the same color card base, wood veneer embellishments, heat embossing, and some die cutting. I definitely achieved a "His" card and a "Hers" card changing up just a few things. I really like the idea of using a favorite sketch and then tweeking certian elements to make it more masculine or feminine. The class has just started, its go at your own pace, check it out! I forgot how much I love glitter. Specifically the super fine Glitter Ritz glitter. I rediscovered my stash of Elizabeth Craft vinyl stickers. SoI prepared an entire page of stickers on a Be Creative Tape sheet over cardstock. 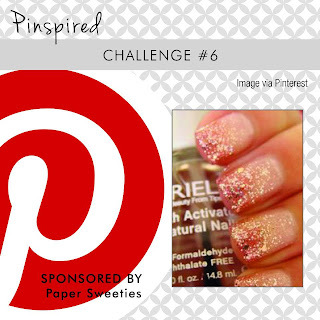 I glittered the stickers with the warm version of the clear glitter. I'll be taking several with me to Maryland to work on. This one was colored with Copic markers. 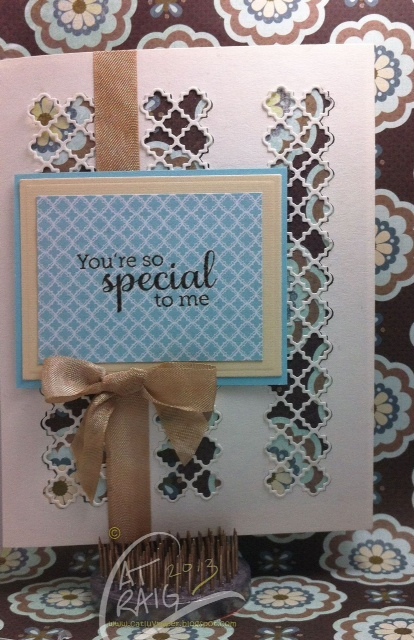 The sentiment is from Stampin' Up's Perfectly Penned. Ink was Hero Arts Shadow Ink in Pale Tomato. I landed a great deal on some Neenah Aspen White smooth 110lb card stock while here in California, and am so much happier with my sturdy card bases. Thanks so much for stopping by. I'll be back in Maryland soon and hopefully my mojo will have returned as well. 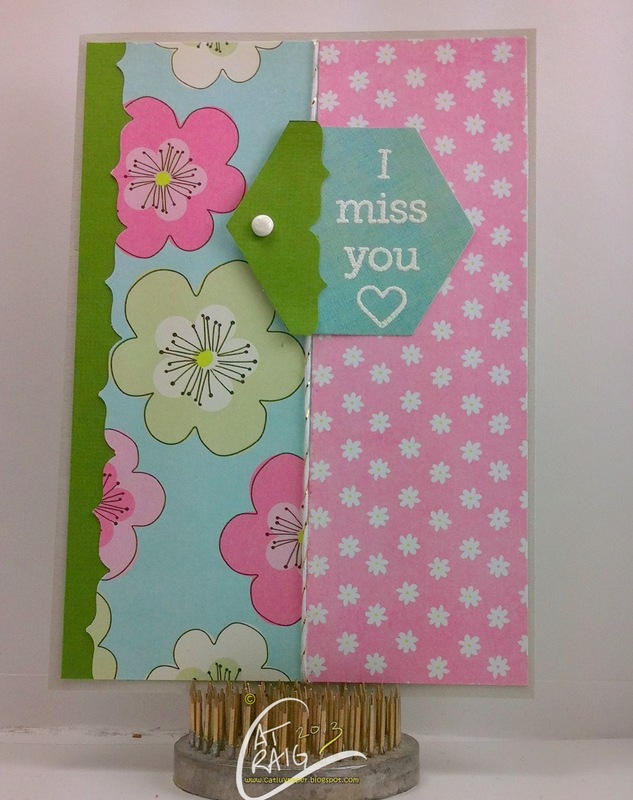 Hi, I made another card for hubs to surprise him before I return to Maryland. The panel is embossed with a Provo Craft folder, and the birds are Elizabeth Craft vinyl stickers. I used Be Creative tape and Glitter Ritz fine glitter inside the stickers, then colored with Copic's. 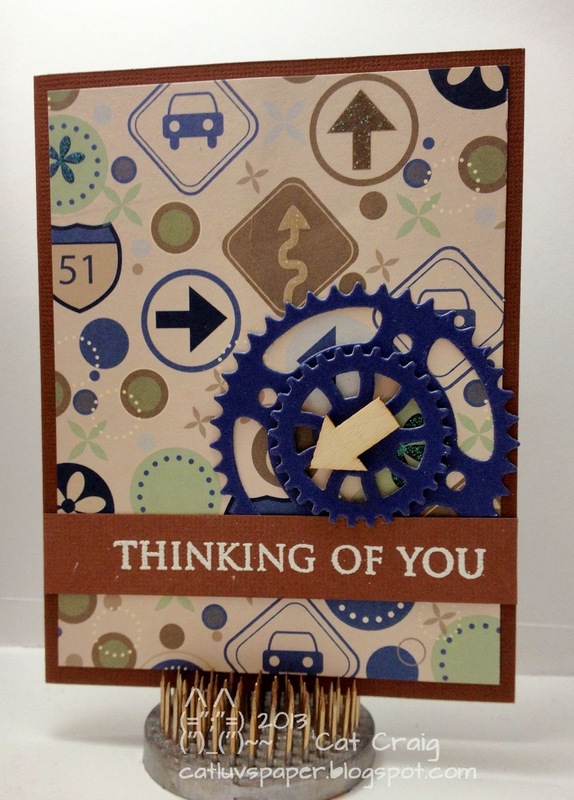 Just a cute quick card for hubs. The sentiment did not photograph well. It says "Wising you weren't so far away". My last week here in California, and I am having such a hard time with cards. I think I miss my east coast crafting spot. I would enjoy looking out the window to watch the squirrels and birds play, the occasional cat wandering through to mock hunt. I have been what feels like on the run since I touched down. I have had many lunches, dinners and outings with friends I haven't seen for quite a while. As well as taking care of some personal business. It has been a whirlwind and it is not over yet. I picked up a used Stampin' Up set called A Flower for All Seasons. The images are cute and handy for a quick card. I've used two of the stamps so far. The first uses a Hero Arts Sentiment, the second uses sentiments from Simon Says Stamp. Both are colored with Copic markers. Oh another Man card. I have a Hero Arts stamp set that is nostalgic, and I think it works well for the guy cards. More Navy Hero Arts Shadow Ink, and I had to put a bit of twine on the card. I can't help myself I have to sneak in a bow on a man card somehow. 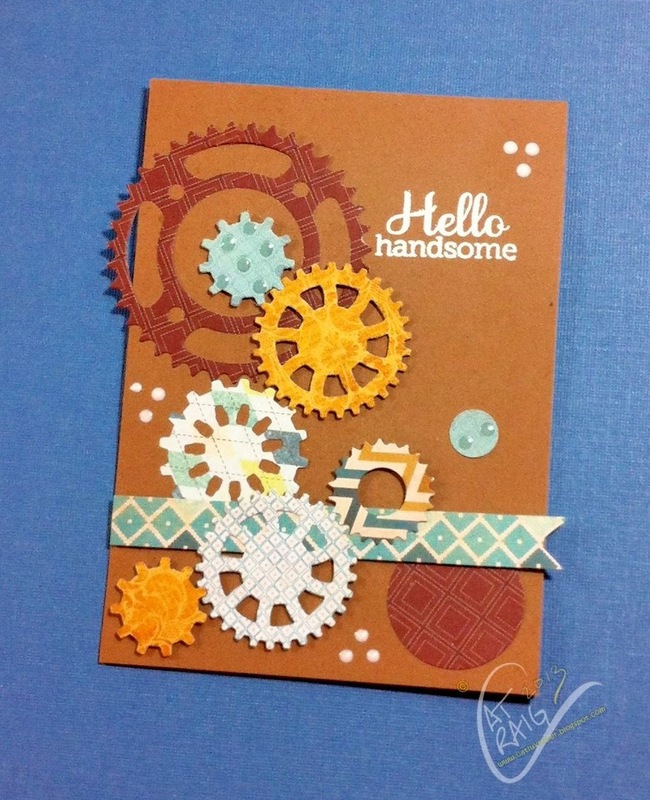 The sentiment is perfectly penned by Stampin Up, I think it is great for man cards. Thanks so much for taking the time to stop by. I had to make a birthday card for one of the neighbor kids who helps hubs out when he needs some inventory moved. I wasn't able to get it made before leaving Maryland, and so I had to send it from California. 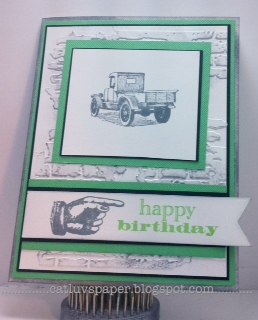 Now I couldn't possibly send just a birthday card to hubs to give away. I had to make one for him too, to let him know I missed him and was thinking of him. Kinda like our courting days, when I sent him greeting cards. I was clearing out some 12X12 scrapbook papers to donate to a local school, and I came across this map paper. I decided it would make an excellent card for hubs, while we were apart. I used the wonderful new to me Navy Shadow Ink by Hero Arts, ohhh this color is soooo inviting. I also used the Pale Tomato. These colors are just so yummy. The arrow and the hearts are Studio Calico wood veneer pieces which I tapped onto the ink pads to give them color, they turned out great! My sentiment is from Hero Arts. The map paper is from Hot of the Press. Have a great day, thanks for stopping by. Hi all, I have been in California about 10 days, and am half way through my visit. My blog has been neglected, my card mojo must be back in Maryland. 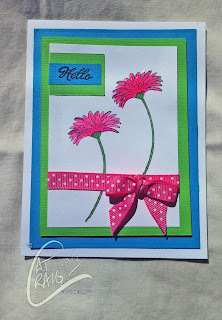 I did manage to make a few cards to share this week. The first is my swap card with my California card making friend, we were able to meet for lunch, instead of mailing our cards. 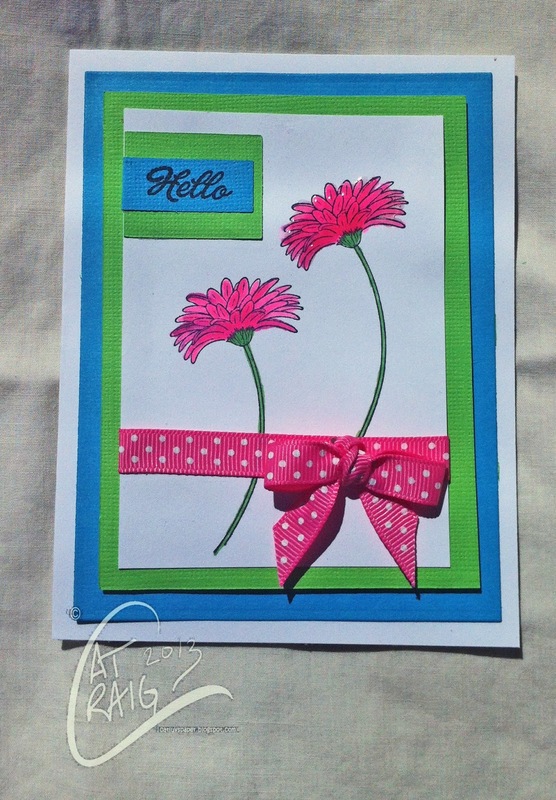 A simple hello card with two pink flowers, the taller of the two has glossy accents to give it some dimension. I wasn't happy with the paper I had here for the card base, it was all so flimsy. So I stopped by Kelly Paper and picked up a ream of 110 weight smooth cardstock. That makes a difference, which will show up on the next posts. 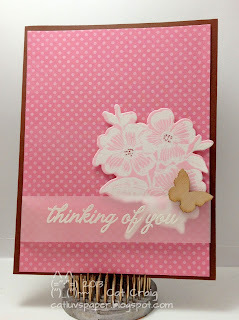 The sentiment is from the Hero Arts Reason to Smile set, the images are Stampin Up. Ink used was Memento Tuxedo Black, and Copic markers in Fluorescent Pink, Shock Pink and Apple Green were used to color the images. The ribbon was an unknown scrap. Thanks for stopping by. I hoard love patterned papers. Signing up for the On Line Card Classes’ Pattern Play was a no brainer. I also really appreciated that it is only a "week" long class. (I put quotes around the week, because none of the classes I have taken were limited to 5 or 10 weekday days, they have had bonus days.) I have trouble keeping going those second weeks. I love all the information, but for my attention span it is a bit long. I will be in California by the time this posts. It is a picture heavy post of each of the cards for the class. I so enjoyed the class. I took notes, I transcribed them each day, I did my homework. I posted to flicker often, but am combining them all in one blog post after the class is over and I have headed to California. I made all the cards for Hubs to open while I am on the west coast taking care of a few things. If you have not taken an online card class, this is an excellent one to start with because of the duration, the fun topic and the large volume of card videos that take you through it step by step. This is my third class and I have enjoyed them all greatly. It was easy to use items I already had in my stash, but that shopping discount is definitely tempting. LOL! I believe there is another week-long class coming up very soon. You can sign up for their newsletter here, and get the class notice as soon as they are announced. Choosing a large, medium, and “solid” type papers to make contrast. Iron off the clear embossing after inking is dried, takes shine off paper. Hi all, time again for a MAN card. These are so darned difficult. This one is for my BIL. He is a great Dad and one of the nicest people you will meet. 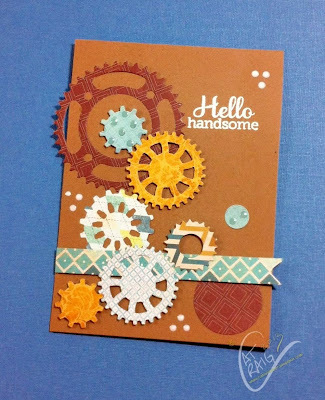 I used a Sizzix embossing folder, and Hero Arts stamps, Ink was also Hero Arts, and the die was from My Favorite things. Cardstock is recollections, white is Stampin Up. Wow, it is April already. It doesn't seem possible. A friend of mine has a birthday today, her favorite color is GREEN. 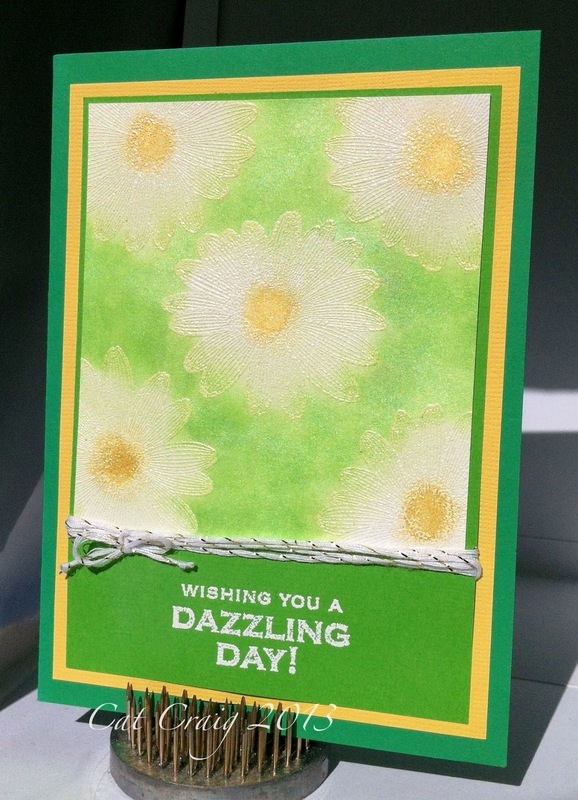 Her card was based on one of the first cards I made with the Hero Arts Etched Daisy stamp. The green reminds me of daisies in a field, and the blue of the flowers against a sky. The inks used for the green and blue portions are the Brilliance Pearlescent Lime and Pearlescent Sky Blue. 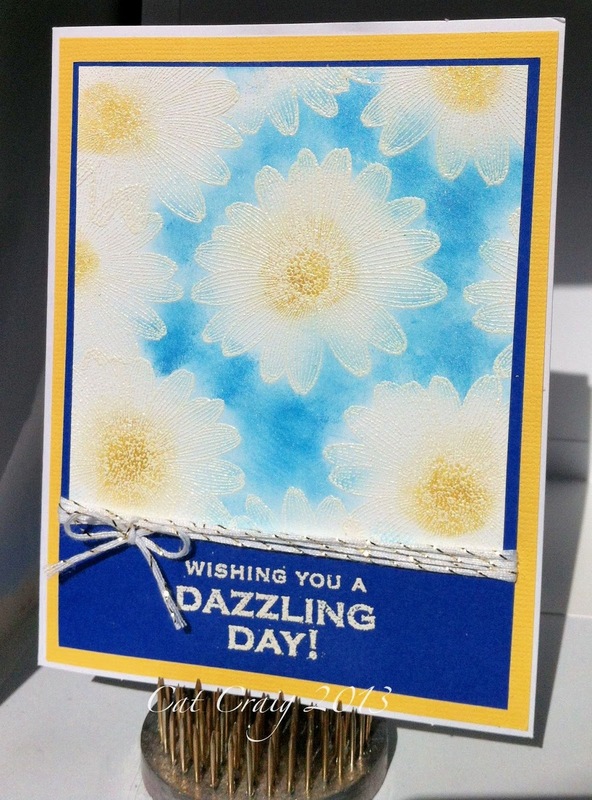 The centers are Galaxy Gold. 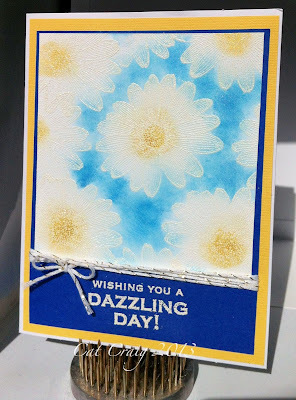 Embossing was done with Versamark and white Tsukineko embossing powder. The sentiment is Hero Arts, and the gold and white twine I picked up at Target. Thanks so much for stopping by. 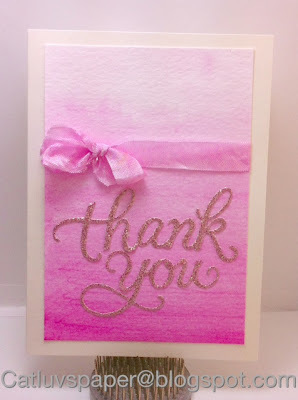 Lately I have been loving pink. Not my normal favorite color, but I am drawn to it lately. When I saw the latest Pinspired Challenge, I immediately had an idea for a card. This happens rarely! I recently had a birthday, and am making my thank you cards. My MIL is a big fan of pink and things sparkly...so my challenge card goes to her. I used Strathmore Watercolor paper and a Derwent Inktense pencil in fuchsia to create the ombre background. The seam binding was also died with color from the pencil. 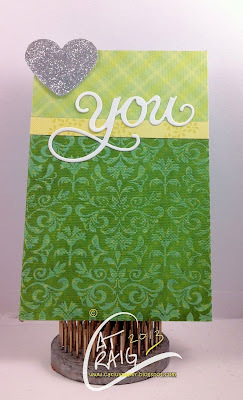 The sentiment is a die cut from Hero Arts using glitter paper...why is glitter so hard to photograph? I am sure my MIL will love it and that is what makes card-making fun.